It is now well known that matter may be trapped by optical fields with high intensity gradients. Once trapped, it is then possible to manipulate microscopic particles using such optical fields, in so-called optical tweezers. Such optical trapping and tweezing systems have found widespread application across diverse fields in science, from applied biology to fundamental physics. 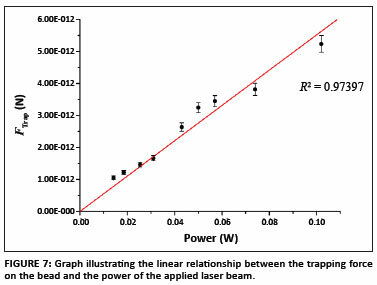 In this article we outline the design and construction of an optical trapping and tweezing system, and show how the resulting interaction of the laser light with microscopic particles may be understood in terms of the transfer of linear and angular momentum of light. We demonstrate experimentally the use of our optical tweezing configuration for the measurement of microscopic forces and torques. In particular, we make use of digital holography to create so-called vortex laser beams, capable of transferring orbital angular momentum to particles. The use of such novel laser beams in an optical trapping and tweezing set-up allows for the control of biological species at the single-cell level. Ashkin and co-workers8 first demonstrated three-dimensional manipulations of microparticles using only laser light. An optical tweezer is formed by tightly focusing a laser beam through an objective lens of high numerical aperture onto a particle. The movement and trapping of the particles along the beam axis are explained by considering two forces generated from the reflection and refraction of rays.9 The two forces, the gradient force and the scattering force, are used to explain the dynamics of an optical trap. The scattering force is governed by the reflection of light incident on a particle and is also referred to as radiation pressure. The incident light reflects off the particle and exerts a force per unit area on the particle. Thus the scattering force pushes particles along the direction of light propagation. The gradient force, however, acts in the direction of the spatial intensity gradient, both laterally and axially. In order to obtain a stable three-dimensional trap, the gradient force in the axial direction must be greater than the scattering force, so as to overcome the radiation pressure. This requires a very steep intensity gradient, which is achieved by sharply focusing the laser beam on to a diffraction-limited spot by using an objective of high numerical aperture. This article outlines the experimental set-up of an optical tweezer and how it can be utilised in measuring microscopic forces. By trapping particles using laser beams that carry angular momentum, optical tweezers may be used to not only demonstrate the rotation of particles, but also to measure the torque applied to the particles. 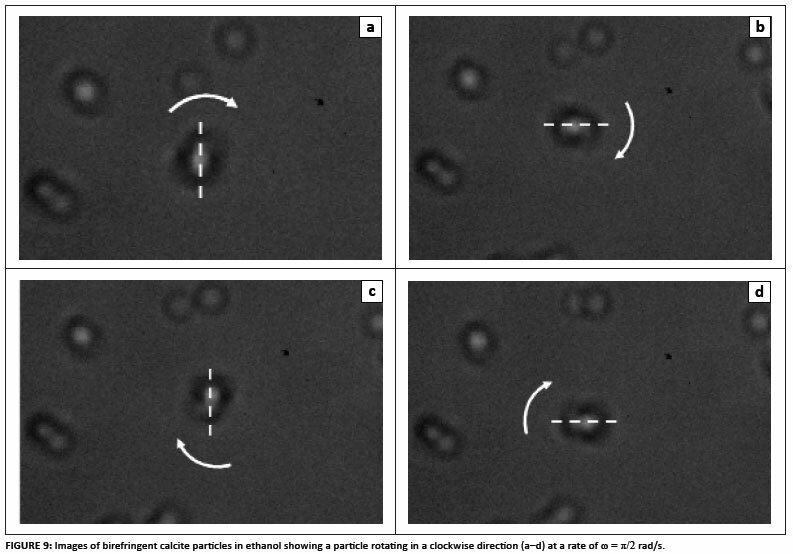 Once a particle is trapped in three dimensions by the tweezer, it ca	n be manipulated either by moving the laser beam with a steering mirror, thereby moving the particle, or by moving the surrounding untrapped particles by moving the sample stage. Repositioning the surrounding untrapped particles is a useful technique to determine the strength of the optical trap. There are several different methods available to determine the strength of the trap. The choice of method depends on the availability of equipment and the degree of accuracy required. The following two methods were chosen based on availability of equipment, and both can be repeated easily without specialised equipment. Experimentally, the only measurement needed is the centroid position of the trapped particle over some period of time in order to calculate the variance in the ensemble. By varying the power of the beam, we are changing the strength of the trap and therefore expect to see a change in the variance. From Hooke's law, the proportionality of the trap stiffness, α, and the force of the trap are clear. Therefore, from [Eqn 3], the variance of the particle's position must be inversely proportional to the force of the trap. where U(x) is the potential energy and kBT is the thermal energy. As the gradient force is assumed to be a conservative force12 (e.g. [Eqn 1]), the potential energy is the energy resulting from an object's position when it is acted on by a conservative force, and hence a potential energy distribution is expected, as given by [Eqn 4]. where vc is the velocity of the fluid at which the particle escapes the trapping force. Thus far, the forces discussed arise as a result of the transfer of linear momentum from the laser beam to the particle to be trapped. However, light may also transfer angular momentum to the particle. Additional trapping aspects can be attained by considering both the spin and orbital components of angular momentum. Spin angular momentum is associated with the polarisation state of light, whereas orbital angular momentum is related to the azimuthal phase of the light. The other component of angular momentum of light, orbital angular momentum, is carried by beams with 'twisted' or helical wavefronts, unlike plane waves. Laguerre-Gauss beams fall into the category of beams known as vortex beams. In 1992, Allen et al.17 showed that a Laguerre-Gaussian (LG) laser mode has a well-defined orbital angular momentum. The modes are commonly denoted by two indices: l is the number of 2π cycles in phase around the circumference, known as the azimuthal mode index, and (p + 1) is the number of radial nodes. The amplitude of the LG mode has an azimuthal angular dependence of exp(-ilφ). The LG modes are thought of as the eigenmodes of the angular momentum operator Lz17, and so, carry an orbital angular momentum of lħ per photon, where l is any integer. Allen et al.17 presented a method to measure the angular momentum of a beam by measuring the torque acting on suspended cylindrical lenses as a result of the reversal of helicity of a LG beam, a similar experiment to that performed by Beth13. 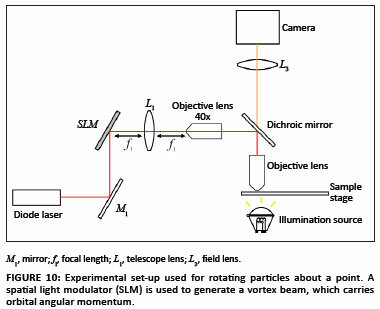 However, the first demonstration of the transfer of orbital angular momentum from a linearly polarised LG beam to absorbing particles was shown by He et al.18 by making use of an optical trapping set-up. As the beam was linearly polarised with σ = 0, the rotation of the trapped particles caused by the transfer of angular momentum demonstrated the transfer of orbital angular momentum. Using the aforementioned optical tweezing methods, we are able to demonstrate the transfer of both linear and angular momentum of light to microscopic particles and, in turn, to quantify the forces and torques experienced on the microscopic level. 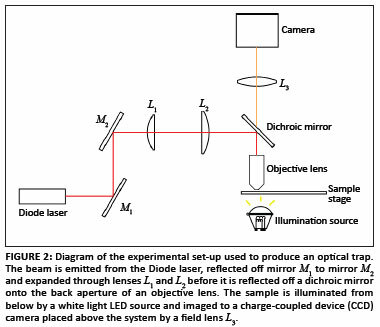 The experimental design and set-up of the optical tweezer (Figure 2) was based on set-ups presented in previous reviews.19,20,21 The beam was expanded through a 3x telescope, f1 = 30 mm and f2 = 100 mm, before it was reflected off the dichroic mirror onto the back aperture of the 100x objective lens. The dichroic mirror transmits light between 455 nm and 650 nm, allowing the laser light (λ = 660 nm) to be reflected, whilst transmitting light from the white light LED illumination source. A 100x objective (model LA-MA-OB-EAB100, LOMO Inc., USA) with a numerical aperture of 1.25, working distance of 0.17 mm, tube length of 160 mm and oil immersion was used. A field lens of focal length f = 150 mm was placed 160 mm above the objective lens, directing the image onto the camera. A Scorpion IEEE-1394 camera (model SCOR-20SO, Spiricon Inc., USA) was used with a resolution of 1600 x 1200 pixels with a pixel size of 4.4 µm x 4.4 µm. Silica beads with a mean diameter given as 4.32 µm and a refractive index of n = 1.44 (Bangs Laboratory Inc., USA) were placed in distilled water (refractive index of 1.33), at a concentration of 0.5 mg/mL. 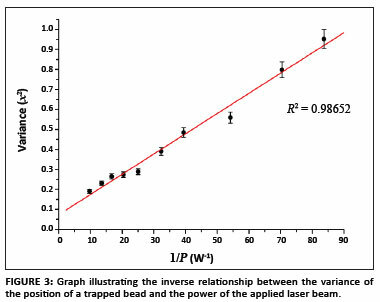 The silica beads have a low absorption at the laser wavelength, and hence are ideal for studying the transfer of linear momentum, that is, refraction-only regimes. 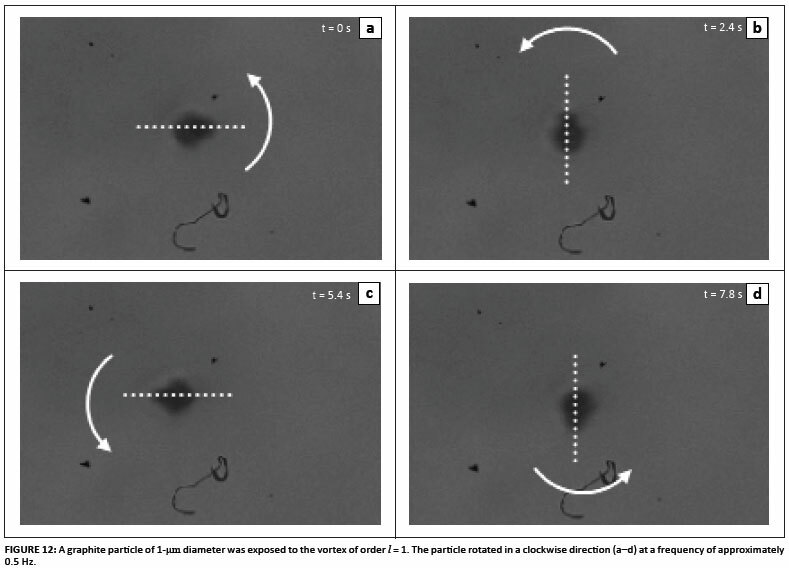 In the first experiment to measure the forces as a result of the transfer of linear momentum, the centroid position of a trapped bead was recorded (over 100 frames of the camera) and the variance calculated. 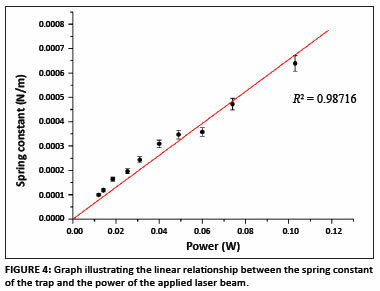 The power of the laser was varied using neutral density filters and the variance of the bead was calculated at each power. We expected an inversely proportional relationship between the beam power and the variance of the particle's position, because strongly trapped particles (high power) have less freedom to move than weakly trapped particles (low power), whereas we expected a linear relationship between the trap strength and the trap stiffness. Figures 3 and 4 illustrate these expected relationships between the trap strength (power of beam) and the variance of the particle position and trap stiffness, respectively. 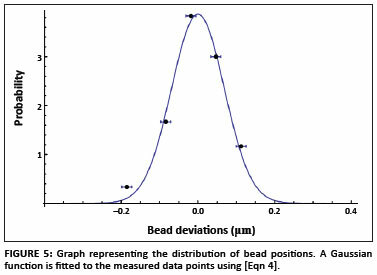 Using the same variance data as above, the distribution of bead positions can be plotted with a fitted curve using [Eqn 4], and is shown in Figure 5. The fitted curve allows the trap stiffness to be determined, where kB = 1.38 x 10-23 m2kg/s2K1 and T = 300 K. The trap stiffness at the lowest measured power was determined to be α = 8.7 x 10-5 N/m, which corresponded quite well with the value calculated at the same power using the variance method of α = 9.9 x 10-5 N/m. The potential energy curve was obtained from the position distribution and clearly shows a parabolic shape (Figure 6). A trapped particle will therefore remain trapped at its equilibrium position unless it gains enough energy to escape the potential well. From [Eqn 10], the escape velocity was calculated to be vc ≈ 36 µm/s, resulting in an escape force of FTrap ≈ 1.5 pN. This calculation was performed at a number of different incident powers, where neutral density filters were used to reduce the power of the beam. The actual power delivered to the trap was difficult to measure because of the fast divergence of the beam. Therefore relative power measurements were made by measuring the power before it entered the objective. 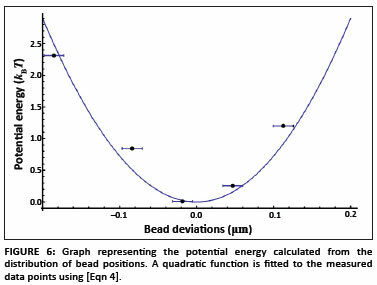 The maximum force acting on the bead for this particular method was calculated to be 5.2 ± 0.3 pN at a power of P = 100 mW, as shown in Figure 7. Improving the accuracy of this measurement is the subject of ongoing research in this field; for review see Neuman and Block20. where Δθ is the change in angular position of the particle within time Δt. Figure 8 shows the particle rotating in an anticlockwise direction, with the time between each of the frames being ~1 s. It is clear that the particle rotated by an angle of 1.6 rad between each of the frames, therefore, according to [Eqn 11], ω = 1.6 ± 0.1 rad/s. The wave plate was then rotated by 90º, causing the polarisation to change handedness; the particle was seen to rotate but in a clockwise direction, as shown in Figure 9. The results in Figures 8 and 9 clearly illustrate the left-handedness and right-handedness of spin angular momentum. Again, the angular speed of rotation was calculated to be ω = 1.6 ± 0.1 rad/s, which is expected, as the direction of polarisation was the only variable to change. Using [Eqn 8], it is possible to calculate the torque exerted on the calcite particle. The viscosity of ethanol is µ = 1.1 × 10-3 Ns/m2, the radius of the particle is approximately a ~ 1 µm and the angular frequency of rotation is calculated as Ω = ω / 2π = 0.25 Hz. Using these values, a torque of = 8 x 10-21 ± 0.4 x 10-21 Nm was obtained. The same calculations can be applied to particles rotating as a result of a transfer of orbital angular momentum. The experimental set-up, however, requires additional elements in order to produce LG beams. The most commonly used method involves a spatial light modulator, which allows beam shaping to be performed quickly and efficiently. Figure 10 shows the changes made to the experimental set-up, where a spatial light modulator has been introduced for the creation of the vortex beam. The vortex beam (a ring of light with a dark centre) was created by programming an azimuthal phase pattern onto the spatial light modulator in the form of a greyscale image, representing a phase change to the incoming beam from 0 (white) to 2π (black) in steps of 2π/255 (greyscale). 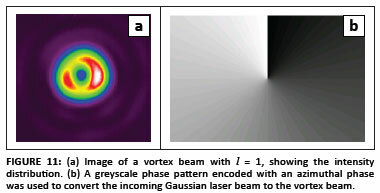 An experimental image of the vortex beam is shown in Figure 11, together with the greyscale image that created it. In this particular experiment, graphite particles of non-uniform size were suspended in distilled water and exposed to a vortex beam of order l = 1. The particles were trapped in the dark centre of the beam and subsequently began to rotate in an anticlockwise direction (Figure 12). Using the same method as previously described, the angular speed was calculated to be approximately ≈ 3 rad/s, giving a rotational frequency of Ω = 0.5 Hz. A torque of τ = 1.2 x 10-20 ± 0.2 x 10-20 Nm was calculated. We have outlined the basic principles of an optical trapping and tweezing system, and shown how the system may be characterised through the measurement of microscopic forces and torques. These results are a prerequisite for a number of applications, particularly in biology and chemistry, which require precise and accurate control (movement, placement, etc.) at the microscopic scale. Thus, whilst this article has concentrated on the method of optical trapping and tweezing, and the careful characterisation of the forces and torques involved at the microscopic level, it would be remiss of us not to comment on the vast applications of such a technique. Another field of research that is gaining a great deal of attention is microfluidics.5 A microfluidic system often refers to a channel system where at least one dimension is on the order of micrometers. These systems are sometimes replicas of macroscale devices and therefore microfluidics is regularly termed 'lab-on-a-chip'. When working on such a small scale, certain properties alter, making some experiments easier to perform than at macroscopic scales. That is, at the microscopic scale, the surface-to-volume ratio increases considerably, causing the flows within the system to be almost laminar.5 Therefore two different solutions can flow next to one another without mixing for as long as a few minutes. 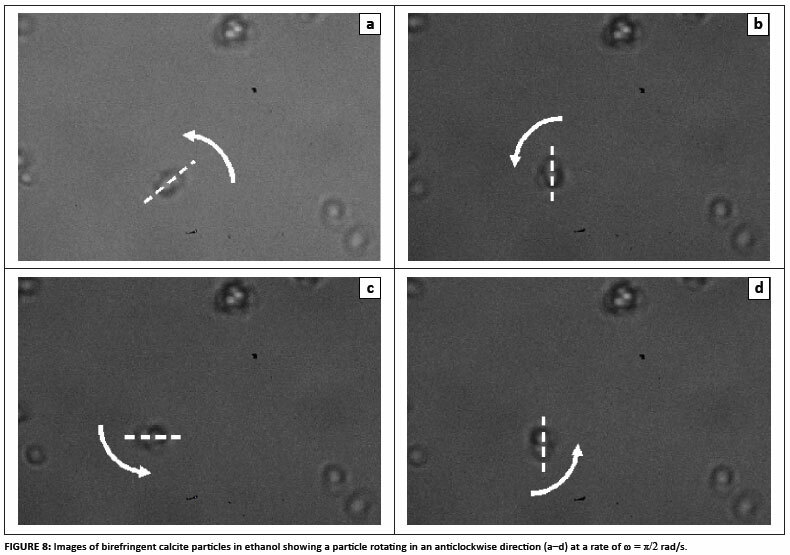 Optical tweezing has been used to trap a particle in one flowing solution and move it across to the neighbouring solution for the purpose of examining the effects of various solutions on a particle.6 The technique is efficient and reversible, allowing particles to be moved from one solution to another and finally returning them to the original solution with ease. Optical trapping and tweezing has opened the way for all-optical control within microfluidic devices: from driving the flow and measuring the flow to manipulating trapped species within the devices. As such, optical trapping and tweezing is proving a versatile tool across many disciplines. We have thus outlined the basic steps needed to build and characterise such a device for the control of microscopic objects using the transfer of momentum of light.